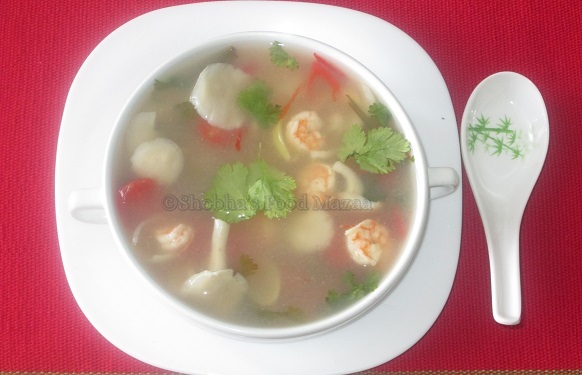 Tom yum goong nam sai - is tom yum with shrimp and clear broth. 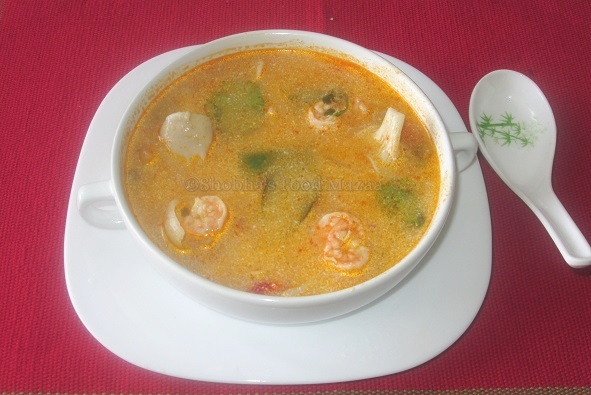 Tom yum goong nam khon - is the creamy / milky version. Salt ... add a little if needed as the fish sauce is salty. 1. Take about one litre of water in a pot and bring it to boil. 2. Tip in the galangal, kafir lime leaves, lemon grass stalks and crushed garlic. 3. Simmer and allow it to boil for 10 minutes to release the herb flavours. 4. Now tip in the cleaned shrimps and mushrooms. Crush the chillies and add to the boiling soup. 5. Allow to boil for 2-3 minutes more. 6. Peel the shallots and cut them into halves. Also cut the the cherry tomatoes into halves.Put them into the pot. 7. Next add the fish sauce, sugar, lemon juice and a little salt if needed after tasting because the fish sauce is salty. 8. Boil for one minute and turn off the heat as the tomatoes and shallots should not be over cooked. 9. Add chopped coriander leaves now to retain the freshness and vibrant colour which is lost during the cooking process. Now you have the clear version of Tom Yum Soup..
Add one tbsp of chilli sauce and stir in the avaporated milk. Boil for one minute and turn off the heat. Note: The sourness and chillies in this soup should be adjusted according to your preference. Lovely..Try to make if I get all the ingredients. 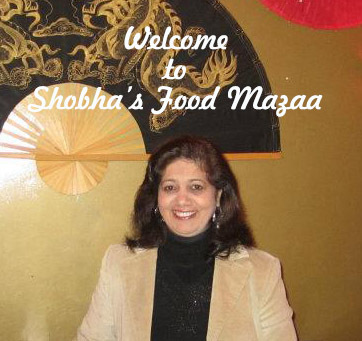 Thanks Moumita .. you will like it I'm sure.. it is nice and tangy. We ate this so much when we were in Thailand. I love it! It is really a very light soup... love it too. I like Tom Yum soup - yours looks lovely! My hubby is a huge fan of clear soups. I could easily make this and replace the shrimp with tofu. A healthy and delicious looking soup. Yes Mayuri.. you can do that.